Attention gardeners, families, and handymen! 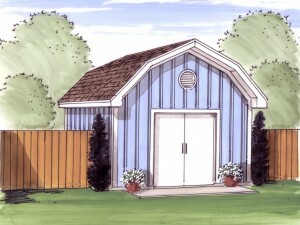 Take a look at this versatile storage shed plan. The ideal addition to any backyard, this shed design accommodates a broad range of needs. Gardeners can use this space to to store lawn and garden tools, supplies and equipment. The workbench is just right for potting plants. Families might find this floor plan especially handy for backyard storage. With the double door entry, it is easy to store bikes, outdoor toys, sporting equipment and the lawn mower. Better yet, this storage shed plan provides extra space freeing up the garage and ensuring you’ll have plenty of room to park the family cars. If the handyman in your life needs a place to store tools and a workbench for tinkering and working on small home repair projects, this storage shed can’t be beat! Delivering 224 square feet of usable storage space, this design will add value and functionality to any backyard. Furthermore, with its simple design and classic gambrel roof, it is easy to imagine this handy shed plan neatly tucked into the corner of your backyard! Please browse our entire collection of shed plans at The Garage Plan Shop. Shed plans are the ideal storage solution for those in need of something smaller than a garage.